New Delhi: Over two crores of Hindu devotees are expected to take a holy dip in the Sangam on Sunday on the occasion of Basant Panchami–the third ‘shahi snan’ (royal bath) of the ongoing Kumbh Mela in Prayagraj. 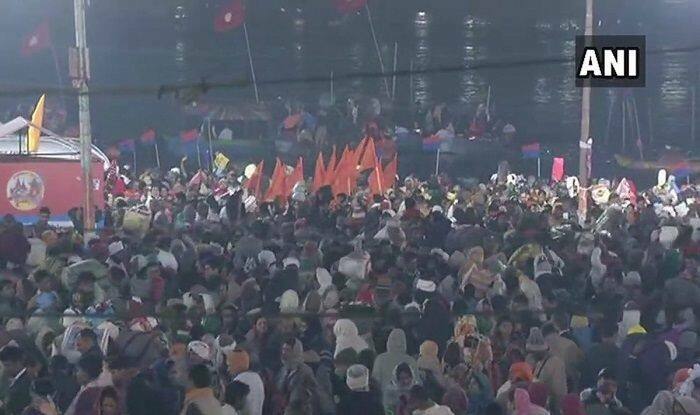 Devotees have started thronging at the river bank. Security in the city was beefed up a day before to avoid any untoward incident. Security personnel, including UP Police and central paramilitary forces, were deployed at different crossings and parts of the city. The Mela commenced on January 15 on Makar Sankranti, the first bathing day, and the Mahashivratri on March 4 will mark its last bathing day. Traffic diversion has been imposed on the side of the fair and district police to keep the traffic system on Basant Panchami. Under this, two-wheeler vehicles will be stopped from 12 am on the night of February 9 in the city. Apart from this, four wheelers will not run till February 11. The festival of Basant Panchami is celebrated as the arrival of spring and is dedicated to Goddess Saraswati. During the first shahi snan around 1.4 crore people had taken the ritual bath in the holy waters of the Sangam. While on Paush Purnima—the second shahi snan—around 70 lakh devotees had taken dip. Notably, Uttar Pradesh government has developed a high-tech, modernised lost and found facility at the Mela to make the process of reuniting families and friends more efficiently.